This article is about the animal circulatory system. For plants, see Vascular tissue. Several terms redirect here. For the song by Ed Sheeran, see Bloodstream (song). For the album by Youves, see Cardio-Vascular. The human circulatory system (simplified). Red indicates oxygenated blood carried in arteries, blue indicates deoxygenated blood carried in veins. Capillaries, which join the arteries and veins, and the lymphatic vessels are not shown. Depiction of the heart, major veins and arteries constructed from body scans. The essential components of the human cardiovascular system are the heart, blood and blood vessels. It includes the pulmonary circulation, a "loop" through the lungs where blood is oxygenated; and the systemic circulation, a "loop" through the rest of the body to provide oxygenated blood. The systemic circulation can also be seen to function in two parts – a macrocirculation and a microcirculation. An average adult contains five to six quarts (roughly 4.7 to 5.7 liters) of blood, accounting for approximately 7% of their total body weight. Blood consists of plasma, red blood cells, white blood cells, and platelets. Also, the digestive system works with the circulatory system to provide the nutrients the system needs to keep the heart pumping. Oxygenated blood enters the systemic circulation when leaving the left ventricle, through the aortic semilunar valve. 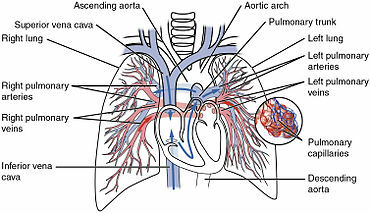 The first part of the systemic circulation is the aorta, a massive and thick-walled artery. The aorta arches and gives branches supplying the upper part of the body after passing through the aortic opening of the diaphragm at the level of thoracic ten vertebra, it enters the abdomen. Later it descends down and supplies branches to abdomen, pelvis, perineum and the lower limbs. 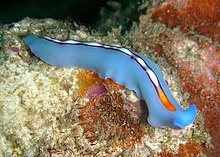 The walls of aorta are elastic. This elasticity helps to maintain the blood pressure throughout the body. When the aorta receives almost five litres of blood from the heart, it recoils and is responsible for pulsating blood pressure. Moreover, as aorta branches into smaller arteries, their elasticity goes on decreasing and their compliance goes on increasing. Capillaries merge into venules, which merge into veins. The venous system feeds into the two major veins: the superior vena cava – which mainly drains tissues above the heart – and the inferior vena cava – which mainly drains tissues below the heart. These two large veins empty into the right atrium of the heart. The heart pumps oxygenated blood to the body and deoxygenated blood to the lungs. 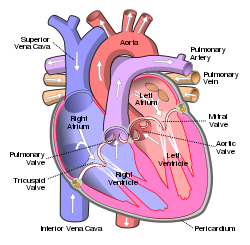 In the human heart there is one atrium and one ventricle for each circulation, and with both a systemic and a pulmonary circulation there are four chambers in total: left atrium, left ventricle, right atrium and right ventricle. The right atrium is the upper chamber of the right side of the heart. The blood that is returned to the right atrium is deoxygenated (poor in oxygen) and passed into the right ventricle to be pumped through the pulmonary artery to the lungs for re-oxygenation and removal of carbon dioxide. The left atrium receives newly oxygenated blood from the lungs as well as the pulmonary vein which is passed into the strong left ventricle to be pumped through the aorta to the different organs of the body. The heart itself is supplied with oxygen and nutrients through a small "loop" of the systemic circulation and derives very little from the blood contained within the four chambers. The coronary circulation system provides a blood supply to the heart muscle itself. The coronary circulation begins near the origin of the aorta by two coronary arteries: the right coronary artery and the left coronary artery. After nourishing the heart muscle, blood returns through the coronary veins into the coronary sinus and from this one into the right atrium. Back flow of blood through its opening during atrial systole is prevented by the Thebesian valve. The smallest cardiac veins drain directly into the heart chambers. The pulmonary circulation as it passes from the heart. Showing both the pulmonary and bronchial arteries. The circulatory system of the lungs is the portion of the cardiovascular system in which oxygen-depleted blood is pumped away from the heart, via the pulmonary artery, to the lungs and returned, oxygenated, to the heart via the pulmonary vein. 2 is released from the blood, and oxygen is absorbed. The pulmonary vein returns the now oxygen-rich blood to the left atrium. The brain has a dual blood supply that comes from arteries at its front and back. These are called the "anterior" and "posterior" circulation respectively. The anterior circulation arises from the internal carotid arteries and supplies the front of the brain. The posterior circulation arises from the vertebral arteries, and supplies the back of the brain and brainstem. The circulation from the front and the back join together (anastomise) at the Circle of Willis. The lymphatic system is part of the circulatory system. It is a network of lymphatic vessels and lymph capillaries, lymph nodes and organs, and lymphatic tissues and circulating lymph. One of its major functions is to carry the lymph, draining and returning interstitial fluid back towards the heart for return to the cardiovascular system, by emptying into the lymphatic ducts. Its other main function is in the adaptive immune system. 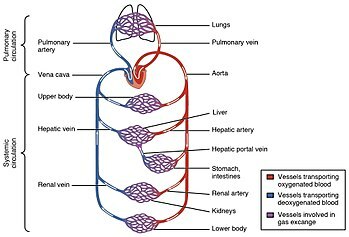 The human arterial system originates from the aortic arches and from the dorsal aortae starting from week 4 of embryonic life. The first and second aortic arches regress and forms only the maxillary arteries and stapedial arteries respectively. The arterial system itself arises from aortic arches 3, 4 and 6 (aortic arch 5 completely regresses). Animation of a typical human red blood cell cycle in the circulatory system. This animation occurs at a faster rate (~20 seconds of the average 60-second cycle) and shows the red blood cell deforming as it enters capillaries, as well as the bars changing color as the cell alternates in states of oxygenation along the circulatory system. Many diseases affect the circulatory system. These include a number of cardiovascular diseases, affecting the cardiovascular system, and lymphatic diseases affecting the lymphatic system. Cardiologists are medical professionals which specialise in the heart, and cardiothoracic surgeons specialise in operating on the heart and its surrounding areas. Vascular surgeons focus on other parts of the circulatory system. Diseases affecting the cardiovascular system are called cardiovascular disease. The open circulatory system of the grasshopper – made up of a heart, vessels and hemolymph. The hemolymph is pumped through the heart, into the aorta, dispersed into the head and throughout the hemocoel, then back through the ostia in the heart and the process repeated. Hemolymph fills all of the interior hemocoel of the body and surrounds all cells. Hemolymph is composed of water, inorganic salts (mostly sodium, chloride, potassium, magnesium, and calcium), and organic compounds (mostly carbohydrates, proteins, and lipids). The primary oxygen transporter molecule is hemocyanin. Human anatomical chart of blood vessels, with heart, lungs, liver and kidneys included. Other organs are numbered and arranged around it. Before cutting out the figures on this page, Vesalius suggests that readers glue the page onto parchment and gives instructions on how to assemble the pieces and paste the multilayered figure onto a base "muscle man" illustration. "Epitome", fol.14a. HMD Collection, WZ 240 V575dhZ 1543. In 1025, The Canon of Medicine by the Persian physician, Avicenna, "erroneously accepted the Greek notion regarding the existence of a hole in the ventricular septum by which the blood traveled between the ventricles." Despite this, Avicenna "correctly wrote on the cardiac cycles and valvular function", and "had a vision of blood circulation" in his Treatise on Pulse. [verification needed] While also refining Galen's erroneous theory of the pulse, Avicenna provided the first correct explanation of pulsation: "Every beat of the pulse comprises two movements and two pauses. Thus, expansion : pause : contraction : pause. [...] The pulse is a movement in the heart and arteries ... which takes the form of alternate expansion and contraction." Michael Servetus was the first European to describe the function of pulmonary circulation, although his achievement was not widely recognized at the time, for a few reasons. He firstly described it in the "Manuscript of Paris" (near 1546), but this work was never published. And later he published this description, but in a theological treatise, Christianismi Restitutio, not in a book on medicine. Only three copies of the book survived but these remained hidden for decades, the rest were burned shortly after its publication in 1553 because of persecution of Servetus by religious authorities. ^ "Let's beat cancer sooner". Cancer Research UK. Retrieved April 13, 2017. ^ "How does the blood circulatory system work?". PubMed Health. 1 August 2016. ^ a b Sherwood, Lauralee (2011). Human Physiology: From Cells to Systems. Cengage Learning. pp. 401–. ISBN 978-1-133-10893-1. ^ Pratt, Rebecca. "Cardiovascular System: Blood". 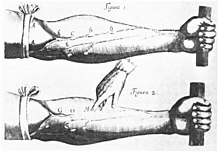 AnatomyOne. Amirsys, Inc. Archived from the original on 2017-02-24. ^ a b c d Guyton, Arthur; Hall, John (2000). Guyton Textbook of Medical Physiology (10 ed.). ISBN 978-0-7216-8677-6. ^ National Institutes of Health. "What Are the Lungs?". nih.gov. Archived from the original on 2014-10-04. ^ State University of New York (February 3, 2014). "The Circulatory System". suny.edu. Archived from the original on February 3, 2014. ^ Alberts, B.; Johnson, A.; Lewis, J.; Raff, M.; Roberts, K.; Walters, P. (2002). Molecular Biology of the Cell (4th ed.). New York and London: Garland Science. ISBN 978-0-8153-3218-3. ^ Whitaker, Kent (2001). "Fetal Circulation". Comprehensive Perinatal and Pediatric Respiratory Care. Delmar Thomson Learning. pp. 18–20. ISBN 978-0-7668-1373-1. ^ Wier LM, Steiner CA, Owens PL (April 17, 2015). "Surgeries in Hospital-Owned Outpatient Facilities, 2012". HCUP Statistical Brief #188. Rockville, MD: Agency for Healthcare Research and Quality. ^ Monahan‐Earley, R., Dvorak, A.M., & Aird, W.C. (2013). Evolutionary origins of the blood vascular system and endothelium. Journal of Thrombosis and Haemostasis 11 (s1): 46–66. ^ Bailey, Regina. "Circulatory System". biology.about.com. ^ Simões-Costa MS, et al. 2005. The evolutionary origin of cardiac chambers. Dev. Biol. 277: 1–15. ^ "Crocodilian Hearts". National Center for Science Education. October 24, 2008. Retrieved October 3, 2015. ^ a b Dwivedi, Girish & Dwivedi, Shridhar (2007). "History of Medicine: Sushruta – the Clinician – Teacher par Excellence" Archived October 10, 2008, at the Wayback Machine, Indian J Chest Dis Allied Sci Vol. 49 pp. 243–244, National Informatics Centre (Government of India). ^ Anatomy – History of anatomy. Scienceclarified.com. Retrieved 2013-09-15. ^ Shoja, M.M. ; Tubbs, R.S. ; Loukas, M.; Khalili, M.; Alakbarli, F.; Cohen-Gadol, A.A. (2009). "Vasovagal syncope in the Canon of Avicenna: The first mention of carotid artery hypersensitivity". International Journal of Cardiology. 134 (3): 297–301. doi:10.1016/j.ijcard.2009.02.035. PMID 19332359. ^ Hajar, Rachel (1999). "The Greco-Islamic Pulse". Heart Views. 1 (4): 136–140 . Archived from the original on 2014-01-09. ^ Reflections, Chairman's (2004). "Traditional Medicine Among Gulf Arabs, Part II: Blood-letting". Heart Views. 5 (2): 74–85 . Archived from the original on 2007-09-11. ^ West, J.B. (2008). "Ibn al-Nafis, the pulmonary circulation, and the Islamic Golden Age". Journal of Applied Physiology. 105 (6): 1877–1880. doi:10.1152/japplphysiol.91171.2008. PMC 2612469. PMID 18845773. ^ Pormann, Peter E. and Smith, E. Savage (2007) Medieval Islamic medicine Georgetown University, Washington DC, p. 48, ISBN 1-58901-161-9. ^ "The Nobel Prize in Physiology or Medicine 1956". Nobel Foundation. Retrieved 2007-07-28. ^ "The Role of Heart Catheterization and Angiocardiography in the Development of Modern Medicine". Retrieved 2017-10-08. ^ Wayne, Tiffany K. (2011). American women of science since 1900. Santa Barbara, Calif.: ABC-CLIO. pp. 677–678. ISBN 978-1-59884-158-9. 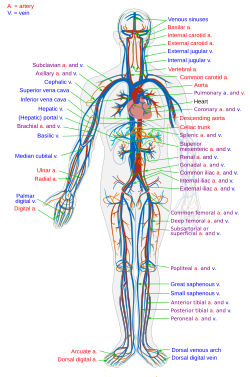 Wikimedia Commons has media related to Circulatory system. Look up circulatory system in Wiktionary, the free dictionary.